The sun is shining in the sky and there is abundant fresh produce in the market. 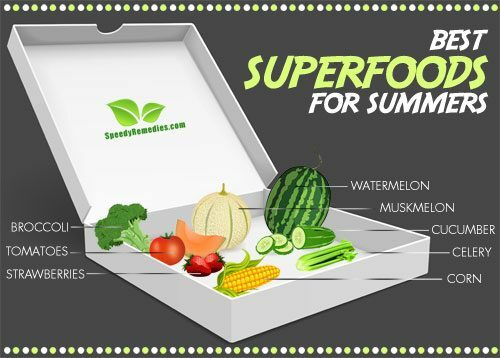 Summer foods pack tons of nutritional value, flavor, and crunch. The markets are abuzz with people on the lookout for the freshest fruit or vegetable they can grab, and the fragrances are just delectable. Summer can also be a trying time. Dehydration is a common complaint. You may feel worn-out faster during summer if you work a strenuous job. Often, this induces a state of perpetual lethargy that ultimately takes a toll on your overall health as you begin to skip meals, ditch the gym, and neglects your body’s warning signals. Let us look at a few super foods that you can incorporate into your diet to ensure daily intake of nutrients during summers. During summer, you sweat profusely which throws off your body’s water balance. Working out becomes tough as you find yourself devoid of energy. Watermelon is 92 percent water, and therefore, has incredible hydrating properties. When you sweat, you lose electrolytes – essential minerals responsible for fluid-balance in the cell and for sending water and nutrients throughout the body. Watermelons contain electrolytes like sodium and potassium. While sodium prevents over hydration and activates body’s thirst response, potassium balances water levels and metabolizes carbohydrates and proteins to release energy that keeps you going through summer. When the temperatures are running high, it is also natural to become a little irritable. Watermelon is rich in Vitamin C that stabilizes mood swings. A 2011 study published in the Nutrition journal notes that Vitamin C supplements (500 mg twice/day) improved the moods of acutely hospitalized patients by a whopping 34 percent. No wonder the juicy center of watermelon provides instant refreshment – it is all that vitamin C at work. Raw: Dice one ripe watermelon, refrigerate it for 20-30 minutes, and consume daily as a mid-morning snack. Take 1 cup diced watermelon in a bowl. Add 1 tablespoon of lime juice and 1/2 cup of coconut water to the fruit. Throw in 5 to 6 mint leaves and some ice cubes. Enjoy the smoothie once every day in the morning for a refreshing start. With 91% water content, cantaloupes possess terrific hydrating properties. Cantaloupes provide sodium and potassium to the body that are lost through perspiration during summer. Since sodium and potassium manage body fluid levels, transmit water to other organs, and regulate the body’s thirst response, loss of these electrolytes due to dehydration can prove harmful. Moreover, cantaloupes are a rich source of complex carbohydrates that release energy slowly and sustain it longer. Therefore, during summer when it is easy to feel fatigued, cantaloupes provide the energy required to keep functioning. They are also a rich source of folic acid. A 2005 study published in the Journal of Psychopharmacology noted that citizens of Hong Kong and Taiwan who consumed regular dietary folic acid reported lower depression rates than other countries. Hence, during summers when you feel bogged down due to humid temperatures, a cantaloupe might just be the mood fixer you need. Raw: Dice 1 refrigerated, peeled and seeded cantaloupe, sprinkle it with some cardamom powder and sugar to taste (optional), and eat daily as a mid-morning snack. Take one half peeled, seeded and diced cantaloupe in a blender. Throw in some ice cubes. Sweeten with 1 teaspoon of honey. Blend for 30 seconds and then consume. Drink this every morning for a fresh start. “Cool as a cucumber” – we’ve all heard the phrase. It is 95 percent water, which makes it the perfect food to snack on all summer and battle dehydration. Soaring summer temperatures often send our stress hormones into an overdrive mode and the depleting reserves of energy seem to exhaust us. Cucumbers contain vitamin B1 that converts food into energy and strengthens the immune system to fight stress. Besides consumption benefits, cucumbers also soothe summer irritation, swelling and burns when applied topically. Cucumber is anti-inflammatory which makes it the perfect face pack for mildly sun burnt skin. Its water content soothes parched and flaky summer skin, thus moisturizing dehydrated skin. Peel 1 medium cucumber, trim the ends, slice it into ½-inch bands. Submerge the slices in a pitcher containing 4 cups of water. Let the ingredients steep overnight in the refrigerator. Drink this cucumber water 20 to 30 minutes before each meal daily. Alternatively, you can scrub and slice one cucumber (peeled or unpeeled) and eat as a side with each meal daily. Make sure you purchase organic cucumbers to avoid pesticides. Celery contains around 95 percent water. Dehydration due to perspiration during summer can lead to heat strokes, kidney failure and seizures. Seizures are often a result of an imbalance of electrolytes – minerals that are responsible for fluid balance in the body. Celery contains potassium that is an essential electrolyte responsible for maintaining water balance in the body. Due to the high level of humidity, many of us suffer migraines and headaches during summer. Celery contains vitamin B2 that suppresses migraines. According to a 2004 study published in European Journal of Neurology, patients who consumed 400 mg of Vitamin B2 capsules for 6 months reported reduced migraine occurrence from 4 days/month to 2 days/month. Another common complaint during summer is lack of stamina. Since celery is also a high-fiber vegetable, it releases energy in slow doses in the body, sustaining longer periods of activity. Take 4 stalks of celery (sliced) in a bowl. Flavor with 1/4 cup of celery leave. Grease with 2 tablespoons of extra-virgin olive oil. Add one half teaspoon of grated lemon zest in the bowl. Fill in the flavors of 1 teaspoon lime juice, 1/4 teaspoon of salt and 1/4 teaspoon of pepper. Sprinkle one ounce of parmesan cheese (optional), and consume everyday as a side salad. Many of us feel bloated up during summers as the weather induces inactivity, often causing us to skip exercise. We also perspire excessively and get tired quickly. Corn is rich in fiber that, along with the folic acid, B-complex vitamin and protein content of corn regulate sugar uptake during digestion. Since sugar converts into energy, this regulation ensures our body’s energy is released slowly and gradually to keep us active longer. According to a study published in New England Journal of Medicine, a group of patients suffering from Type 2 diabetes when put on a six-week high-fiber diet reported regulated blood sugar and increased energy levels. The complex carbohydrates found in corn further keep the body energized during summer as they are digested slowly and, therefore, release energy gradually. Complex carbohydrates also release serotonin – hormones that enhance mood. Hence, some fresh corn-on-the-cob is the perfect blend of energy and happiness during summer. Grease a corn ear with just enough olive oil. Sprinkle some edible salt on it. Grill on medium heat for 5 to 7 minutes. Top it with some lemon juice and serve hot. Incorporating tomatoes into your daily diet will help restore fluid lost due to perspiration and prevent dehydration as they contain 94 percent water. Summer is also the time of reduced energy levels and inactivity. Tomatoes contain alpha lipoic acid that breaks down carbohydrates in the body to release energy. A 2015 study published in Nutrition Journal relays that 95 menopausal women (40-60 years old) reported increase in resting energy and reduction in anxiety level after consuming tomato juice for 8 weeks. The anxiety inhibiting property of tomatoes further points to its mood refreshing benefits – a major concern during summer when rising temperatures often cause irritability and impatience. Furthermore, tomatoes contain lycopene which protect the skin from visible sunburn, and more importantly, from the long-term effects of harmful ultraviolet rays during summer. You can consume the fruit in its raw form or extract its juice. Take 2 to 3 washed whole tomatoes in a blender. Throw in other veggies like 1 celery rib, 1 onion (quartered) and 1 carrot (peeled and diced). Add 3 to 4 fresh basil leaves. Blend for 2 to 3 minutes. Top it with ice cubes and enjoy the juice every day, 20 minutes before breakfast. Nothing screams summer like the first bite of a fresh, succulent strawberry. Strawberries contain about 90% water and can prevent dehydration during summer. Strawberries are, perhaps, best known for their vitamin C abundance. According to a study published in the Journal of the American Academy of Dermatology, sun burnt patients who consumed a combined dose of Vitamin C and E reported reduced inflammation after 8 days. Hence, this study highlights the benefit of a Vitamin C rich diet, especially during summer when the sun’s ultraviolet rays are especially harsh. Strawberries are also rich sources of Vitamin B6 that aids the production of carbohydrates into energy. This is essential during summer when increased perspiration and exertion deplete our stamina. According to the University of Maryland Medical Center, strawberries also enhance serotonin – the body’s mood regulating hormone. Higher strawberry consumption will battle summer blues and refresh our mood. You can consume the fruit in its raw form or delight yourself with a smoothie. Pour 1 cup low-fat milk in a blender. Add 3 cups of strawberries and 1/2 teaspoon of honey. Blend for 2 to 3 minutes and enjoy with/without ice. Note: Restrict consumption of this smoothie to 3 times a week as a vitamin C overdose causes nausea and diarrhea. Broccoli is the super-hydrating wonder vegetable that contains 92% water and keeps our fluid balance in check during heat waves. Furthermore, during summer, we tend to experience a loss of stamina owing to oppressive weather conditions and consequent perspiration. Broccoli is a rich source of a plant metabolite called kaempferol that enhances cellular energy. A 2013 study published in the Food Chemistry journal substantiated the fact that an intake of kaempferol increases the amount of energy released by cells, thereby affecting the general energy levels of the body. The vitamin C in broccoli further keeps us active carbohydrate diet into energy. It also combats summer mood-swings by accelerating the production of mood-enhancing hormone serotonin. Dice 1 bunch of broccoli and grease the florets with olive oil. Sprinkle some salt and pepper on the florets. Grill on medium heat for 10 to 15 minutes. Squeeze the juice of one lemon over cooked broccoli and enjoy. Journal of Psychopharmacology: Treatment of depression – time to consider folic acid and vitamin B12. European Journal of Neurology: High-dose riboflavin treatment is efficacious in migraine prophylaxis: an open study in a tertiary care centre. Obesity Research: Brain serotonin, carbohydrate-craving, obesity and depression. Journal of the American Academy of Dermatology: Protective effect against sunburn of combined systemic ascorbic acid (vitamin C) and d-alpha-tocopherol (vitamin E). Diabetes: The small polyphenolic molecule kaempferol increases cellular energy expenditure and thyroid hormone activation.